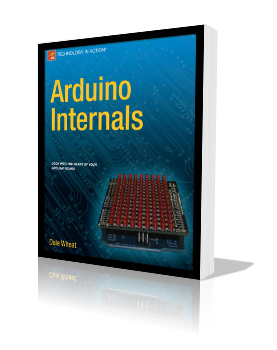 Over the summer, I wrote a book about Arduino internals, called Arduino Internals. It is being published today by Apress. It has a lot of detailed information about Arduinos as well as Atmel AVRs. There are several projects in the book that illustrate some of the topics. It’s a paperback book that runs to just over 350 pages. There’s also an “ebook” available in several popular formats. You should be able to buy your very own copy today from Amazon with a nice little discount and free Super-Saver shipping. You can also go to your favorite book seller and buy a copy. Just use the ISBN number 978-1430238829. To buy the ebook, go to the book’s page on the Apress web site, apress.com. This was a very exciting project for me. It’s my first book. I hope you enjoy it. Update: The publication date has been bumped to November 16, 2011. I don’t know why. I’m just somewhere in the middle of your book, but it’s hands down the best about Arduino I had in my hands until now. Well composed, and answering almost all of the questions I had. Thanks so much for your kind words! They are very much appreciated. Mistake? Surely you’re mistaken! 😀 I’d be happy to address any issues or questions you might have. There’s even a section on the publisher’s product page for ‘errata’ that are found after the book has gone to press. Please email me directly at dale at dale wheat dot com and let’s get this sorted out! This book is fantastic. It digs DEEP. Had no idea there was so much to the Arduino. Love the Arduino Internals book! It is like a bible to me, and I just wish there were more like it around. I like to know the details of what I am working with, and could never seem to find enough useful information which is accurate, until I found this book of course. Clear, and very enjoyable to read.